The hidden workforce is defined as the manpower and resources that are already present in the economy which is necessary for the success of the organisation. Failure to successfully extract such resources leads to decline the productivity of the organisation. People who are present in the individual workforce perform at an acceptable level and they tend to move from one level to another without creating much attention. They prefer doing non advertised works and practices. The main disadvantage of people working in the hidden workforce is that they tend to lose sight of their objectives and goals. They tend to change their trajectories occasionally. They tend to have a large potential in the industry, but they are often unnoticed and forgotten by their supervisors and managers. So failure in recognising a hidden workforce can lead to halt in the success of the organisation and also in the success of the economy in a large scale. Untapped talent is usually defined as a resource or material that has a large potential for use but has not been exploited to its maximum efficiency and usage. This is because many organisations try to find only unique talent and they tend to develop internal talent that is beneficial for the organisation. For example: One of the most famous examples is the case of Susan Boyle. Susan Boyle was a rather plump and a shy women who was just average looking. She didn’t stand out much, and would always mind her own business. She was nearly 50 when she auditioned for Britain’s Got Talent which is the American version of the American idol. She was not welcomed that much by the judges and the audience alike because of her looks. But when she attempted singing she became a sensation and a trend. Eventually the middle aged woman was placed second in the competition and hence she became an international star. This shows us that the modern society is too hasty to determine others based on their looks that they forget what their core values are. The only way to stop such thinking and teach them a lesson is by showing them what we are made of or by setting up an example. In the above example, Susan clearly showed the power of untapped and hidden talent. When you are an individual who is involved in the hidden workforce, you do not find much happiness in what you do and that results in your productivity and outcome. This is because you feel that you are not fully engaged in your work and you feel that you are not enjoying your work. When that happens you lose which in turn results in the economy losing and in the end nobody wins. Hence, when most of the employees enter a state of disengagement they shrink the active workforce and many of them gets categorised under the hidden workforce. This results in billions and billions of loss for the economy and can affect the actively working organisation. Hence, try to ensure that you have an active workforce and a happy one too. So to achieve this, try to make your workers happy and satisfied. This can be done by providing them with better working facilities, good parking conditions and various other perks. 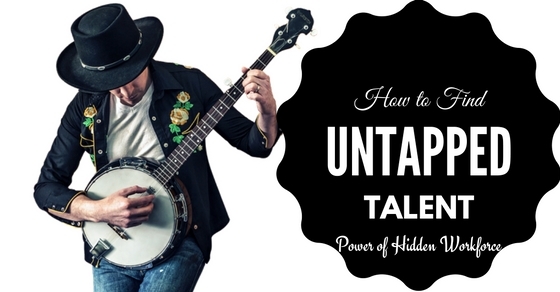 Finding untapped talents can be hard work as they are often unnoticed and ignored. Instead of finding candidates through expensive and time consuming searches, most of the companies try to find employees creatively and and through inexpensive methods. These are the following ways in which, one can discover new and creative talents. Social networking sites such as Facebook and LinkedIn can be used to find new talents by expanding one’s own social networks. This can be done by posting click based advertisements which are more popular and cheaper than the traditional form of posting advertisements such as through the newspaper, billboards and transportation. Moreover, using social networks to post job advertisements are more functional since you are posting a job directly to them rather than posting it in public. If you are finding for an applicant or an employee you can post an advertisement for a job through a Facebook status or a tweet. Chances are people who are in contact within your network would directly come and approach you. Hence, no middlemen are needed and there is no lag in the overall hiring process. The best example of a job searching social networking site is LinkedIn where there are a large number of people having endless potentials who are constantly keeping touch with potential employers through their LinkedIn profile. If you are a person who is interested in starting your own start-up then, search new talents through job searching sites specifically designed for start-ups and such incentives. Such sites focus more on people who are genuinely interested in working for a start-up and not just simply a job. This will result in appointing people who aid in the growth and development of the company. So such sites aid in finding responsible and deserving individuals. If you are finding a cofounder for your start-up sites like Cofoundr, such sites provide an online network for entrepreneurs. This way you can find people who are easily interested in finding people who are interested to be involved in start-ups. Many companies use innovative ways to hire employees who are interested in joining the company. A famous example is the Canadian company named Formashape, a manufacturing company, where they installed a billboard stating “all trespassers will be hired”. One reporter was amused by the innovative way that the company used to garner attention. He then wrote a news article praising the advertisement method. This lead to capture attention from various jobseekers which lead to an increased influx in the number of job applications to the company. Try to be viral with your innovative ideas and techniques. Most aspiring employees search their prospective employers by googling them. Hence, a great way to attract such potential workers is by making your website more interesting and eye catching. Even if your company is good in its industry, it is not perfect without a good website having excellent aesthetics. In this era, most companies use websites as a mirror to reflect the unique work culture and the atmosphere of the company. Add pictures and illustrations that depict a typical day at the office. Once given the relevant information, it makes it easier for the candidates to apply for the positions that they are searching. The main drawback of hidden talent is that, these types of talents are really hard to find and do not show to others very easily. This is the reason why many company recruiters search for unpolished and raw talent. Do not try to wait for talent to come and find you, instead get out into the world and try to find it. For example for finding aspiring writers, you can check sites such as Tumblr and Mediabistro. Also, to find untapped talent try to check at colleges and community colleges. Such institutions encourage students to go out in the open, and you can find aspiring employees at job fairs, placement fairs and sometimes their own job listing sites. Try to find graduating students who are eager to learn, tries to see things in a new perspective and are ready to constantly improve themselves. Try to recruit remote workers, since they have the most potential in getting the job done. Usually remote workers often try to do jobs that are interesting to them and hence they try to do their jobs in a fun and in a unique manner. Also, they are suitable for doing on site jobs. Many company prefer remote work these days since it helps in the development of business strategies, helps in increasing the productivity and also helps in the expansion of the geographical network of the company. These kinds of jobs also attracts new employees who are interested in jobs that include travelling. The recent study by cisco showed that 70% of employees had a higher productivity and output when they are working remotely. Irrespective of the common misconception, many millennials or the generation are interested in doing jobs that include travelling. This is because many millennials crave for adventure, hence they are more than ready to do jobs especially remote and onsite jobs. 1. Attracts the best cross section of talent and hardworking people. 2. They are very loyal to the company and their supervisors. They try to overcome barriers and obstacles together, so they can make a stronger and a more cemented relationship. 3. They help you to fulfill your diversity and reversion policies. 4. They help you in opening a new business market and increases the range of the target audience and customers. 5. They are really good at problem solving. This is because, since they are the hidden workforce they face problems every day. They also try to solve issues with a great amount of creativity. Many companies are successful because they have a creative workforce. 6. Also the hidden workforce represents a wide variety of communities and groups of people. Contingent labourers also comes under the category of the hidden workforce. Contingent labourers are defined as employees who are not permanent and are just kept as temporary employees based on a small contract. So whenever a company manages their employees, try to include the contingent employees. This is necessary as the temporary employees houses a lot of potential and undiscovered talent. Failure in managing a workforce can lead to the decline in the progress of the company and can even lead to a huge loss or bankruptcy. How can we manage a workforce having both kinds of employees? The first step in managing a workforce with contingent labourers is that try to identify the specific roles and positions that are critical for the growth of the company. Try to understand that these positions are the core of your enterprise and has the potential to increase your business value and net worth. Mapping the workforce is a part of workforce management and contingent workers are also included in this planning. To find hidden talent managing the positions available for them is necessary. This is regardless of your employment status, that is, whether you are a permanent or a temporary labour. A category based management requires the collaboration between all kinds of labourers so as to achieve the required output. This type of model usually focusses on five dimensions. The main aim of these five methods is for the company to help deliver and exploit the potentials of their hidden workforce to a maximum. A strategy driven workforce helps you to place and use your employees carefully and this reduces the chances of risks and mistakes that could affect the company’s goals. Also, this type of management is suitable for a flexible workforce. How to Implement an Ideal Workforce? The best method is to implement your plans slowly at a steady pace. This helps the employees to get an idea of the various roles that they are expected to offer and the positions that they are allotted. After assigning, have an interaction with the stakeholders so as to get an idea about the various management risks and dangers. If there are certain dangers and difficulties within a certain area of management, implement these jobs to highly experienced and apt professionals. Low risks jobs can be given to lower level employees. Imagine a workplace where the employees are excited about getting their jobs done and are enjoying it to the fullest. This way we are able to tap raw and hidden talent. Try to make it into a reality and be successful in your business.